Unlike most FeatherWings, the TFT FeatherWing is fully assembled and has a dual socket set for your Feather to plug into. All power for the FeatherWing comes from the 3.3V and GND pins. That includes the backlight (which can draw up to 100mA)! The TFT display, SD card and touch screen use the SPI interface to communicate. That means MISO, MOSI and SCK are used whenever either are accessed. In addition, for the TFT display there is are D/C (Data/Command) and CS (Chip Select) pins. These are used to select the display and tell it what kind of data is being sent. These pins can theoretically be changed by cutting the jumper trace and soldering a small wire from the right-hand pad to the pin you'd like to use. There is also LITE pin which is not connected to any pads but you can use to control the backlight. Pull low to turn off the backlight. You can connect it to a PWM output pin. Note: Pin 9 is used for communication with the SIM800 chip on the Feather Fona. You will have to remap pin 9 to an unused pin when using with a Feather Fona. 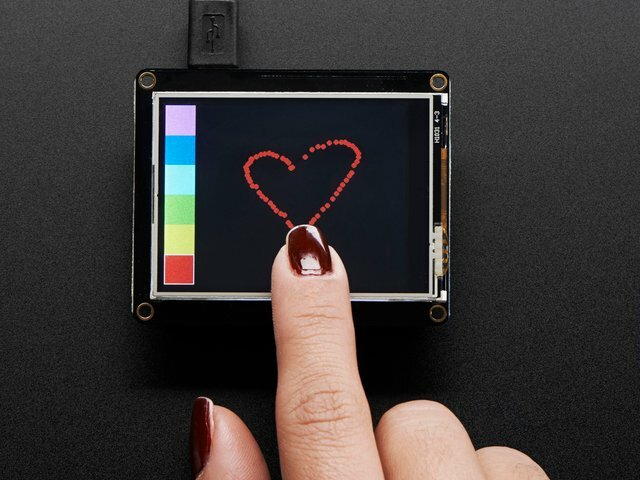 The touch screen also has a Chip Select line, labeled RT. This pin can theoretically be changed by cutting the jumper trance and soldering a small wire from the right-hand pad to the pin you'd like to use. There is also an IRQ pin which is not connected to any pads but you can use to detect when touch events have occured. The SD Card also has a Chip Select line, labeled SD. This pin can theoretically be changed by cutting the jumper trance and soldering a small wire from the right-hand pad to the pin you'd like to use. There is also an Card Detect (CD) pin which is not connected to any pads but you can use to detect when a microSD card has been inserted have occured. It will be shorted to ground when a card is not inserted. This guide was first published on Nov 09, 2016. It was last updated on Nov 09, 2016. This page (Pinouts) was last updated on Apr 25, 2019.